Over the past 9 years Sarva Integrated has proven themselves worthy of being called Sri Lanka’s most effective advertising agency. Their track record of delivering tangible results for their clients through insightful and memorable campaigns stands unblemished up to date. “We whole heartedly believe that all advertising needs to be effective and deliver results that are measurable and go beyond the client’s requirements” says Chrishantha Jayasinghe, Managing Director of Sarva Integrated. In order to keep to their promise of delivering effective advertising, Sarva Integrated has embarked on a strategic training programme that aims to sharpen their abilities, and help them to connect better to their target consumers and their clients’ businesses as well. Well known personalities within the marketing fraternity, experienced academics and even holistic teachers have been invited to conduct seminars and workshops that will help team members to further expand and explore their professional and personal mind frames. 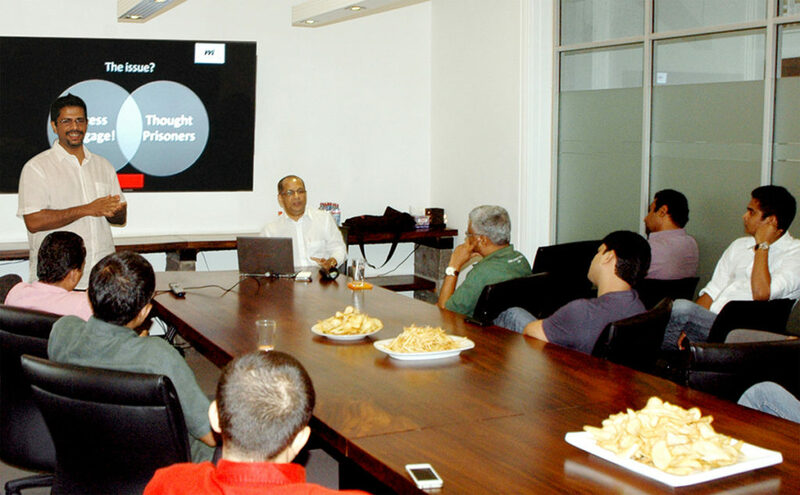 Mr Hilmy Cader of MTI Consulting conducted a seminar on ‘Thinking and Identifying Opportunities’ which was aimed at helping team members better understand their clients’ business models and open their eyes to the various opportunities that are waiting to be exploited with the right form of communication. ‘Our Consumers and How They Decode Communications’ conducted by Ms Dilini Jayasuriya of Breakthrough, a well-known market research agency, took team members through a workshop which helped both brand management and creative conceptualisers to get a fresh perspective on how their advertising campaigns were being perceived by the target audiences. Mr Chrishantha Jayasinghe further stated that “We are quite confident that our on-going series of training seminars and workshops will help us to further sharpen our thinking and deliver communication campaigns that are consistently effective across the board”. With an extensive portfolio of clients such as Lanka Bell, DIMO, Union Assurance, Triumph International, NDB Investment Bank, Pan Asia Bank, Darley Butler (BIC, Denta), ICL Marketing (Secrets, Voodoo), Chevron Lubricants Lanka, Richard Pieris Distributors (Arpico Supermarkets) and many others, Sarva Integrated is well on their way to proving to the world that effective advertising is the only advertising worth paying for.